Lean robotics simplifies the deployment of a robotic cell to help manufacturing engineers get to production faster. Québec City, Canada, September 11th, 2017 – As manufacturers worldwide face off against a growing manual labor skills gap and a transformation of skills, a new methodology promises to unlock every factory’s automation potential. It’s called lean robotics, and it simplifies the deployment of a robotic cell to help manufacturing engineers get to production faster and save costs. With lean robotics, manufacturers take control of their robot cell deployment projects. They learn how to design, integrate, and operate robotic cells as efficiently as possible on their factory floor. The step-by-step guidelines detail how to deploy robots while taking every factory’s unique context into account. Best practices from the field also keep the user aligned with the principles of lean manufacturing, including waste reduction and scaling techniques. 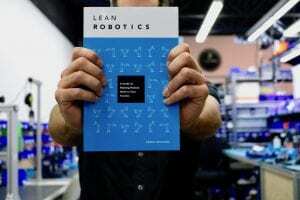 Lean robotics redefines robots as tools for humans to use. The methodology focuses on the output of a robotic cell, which helps the user eliminate waste across the whole deployment cycle. Lean robotics also details the technical skills that should be built and leveraged in order to continuously optimize the factory’s robotic operations. Samuel Bouchard is the CEO of Robotiq, a company that he co-founded in 2008. Robotiq today serves manufacturers globally and has become a dominant voice in the fast-growing collaborative robots industry. It has also been recognized by Robotics Trends as one of the Top 50 most influential companies in robotics. Bouchard holds a Ph.D. in Mechanical Engineering and a Bachelor’s in Engineering Physics from Laval University. He lives in Québec City with his wife and four children.